A note about Records — NOT the Olympic or turntable kind! Some people find it odd to learn that archivists spend a lot of time thinking about what to throw away. It’s true, though, not everything needs to be saved forever. In fact, if we aren’t consciously making decisions it can actually cost more–in terms of staff time and resources to preserve objects–to take care of things we don’t truly need compared to the cost of caring for what we truly value. 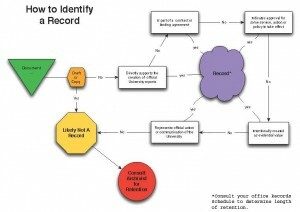 The graphic below is part of a page I created to help IWU offices identify what types of records they create and to determine how long they should keep them. The page also contains terminology to help people think through record keeping decisions. This does not have to be a solo effort! Questions are welcome and you can contact me to talk these decisions through. This entry was posted in Campus Administration, Campus units, Faculty and tagged records management by Meg Miner. Bookmark the permalink.